Guide to climbing Wheeler Peak in Nevada during the winter. An isolated summit in the Great Basin wilderness with a technically easy climb. Its not often that one can claim they are writing anything new on a mountaineering route but it seems that both literary and online information regarding winter climbing on Wheeler Peak are lacking. Other than a few scattered trip reports and a little blurb on the NPS website, this blog might also help those rare souls who would like to climb this isolated peak in the winter. At 13,063ft, Wheeler Peak is Nevada's highest mountain entirely within the state. While Boundary Peak is higher, it is nothing more than an arm of another higher peak in California. Simply put, it doesn't count in my book. I may not be the first person to have ascended Wheeler Peak in the Winter, but I would like to put some more detailed information on the web about what it takes and some general considerations. Wheeler Peak is within Great Basin National Park which I consider to be the most rugged National Park in the contiguous United States. In the winter, there are hardly any visitors save for a few park rangers. You could very well have this park to yourself on a winter weekday. On top of this we have Wheeler Peak which is also incredibly isolated. In the summer, it can be hiked in a long day but in the winter, roads are closed making it a daunting affair. 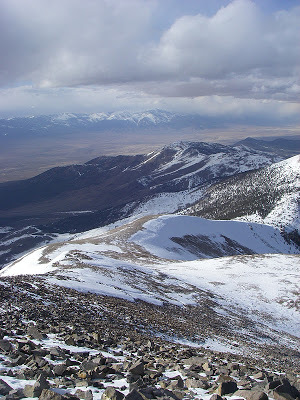 Nevertheless, Wheeler Peak has become somewhat of a classic hike/climb for Nevada and America due to its prominence and topographical isolation. Once you get to Great Basin National Park, you can head up to the Upper Lehman Creek Campground and park the car. This is a paved road that is plowed in the winter and is at the elevation of 7,700ft. It is a very long approach to Wheeler Peak from here and this can be done in one to two days. You can also pay for camping at this campground. The Lehman Creek Trail leaves immediately from the parking lot and generally parallels the creek for about 4 miles before dropping you off at the Wheeler Peak Campground. This trail is generally well marked and is snowshoed on a somewhat regular basis in the winter. Its a steep, winding trail which climbs 2,000ft. Of course, a topographic map is essential for this trip. From the Wheeler Peak Campground, the trail continues to the cirque of alpine lakes. The forest begins to clear at this point making route-finding easier. This is an incredibly beautiful area which makes the 5 mile trek in worthwhile. In the summer, its a nice place to relax and enjoy the mountain air. There's no real name to the route up Wheeler Peak in the winter. In the summer, a trail exists from the Wheeler Campground parking lot to the summit. There are two couliors on the North side of Wheeler Peak. I took the nearly direct North-South coulior which parallels the ridge-line. Its more direct than the Standard Route and easier to find in the winter. However significant rock-fall and avalanche danger exist on this route. The Wheeler Peak ridge-line is notoriously windy and this can create massive cornices which could dump right into the coulior. From Stella Lake, one could make the steep ascent to the col and follow the ridgeline all the way to the peak. Again, almost any time of the winter there will be violent winds and the ascent from Stella Lake also has hazards. Avalanche danger appeared to be low on the day that I went and I preferred the protection of the coulior to the horrendous winds. You will have to make a judgement call when you make it to the Cirque. Despite the hazards, the ascent is gentle and easily trans-versed with a mountaineering ice axe and crampons. Either way will bring you to a flattened area and the summit will be in view. The final push for the summit is not steep but it is cold, windy and will leave you oxygen starved. The summit itself is exposed and cliffy; be mindful of potential cornices and incoming storms. The view from the top is one in a million. Its gives an excellent perspective of the Great Basin and its endless ranges and valleys. Nevada is a unique state whose outdoor adventures are often overshadowed by Las Vegas. Its almost a 14 mile trek when its all said and done with about 5,300ft of elevation gain. For the record, it is the 2nd highest point in Nevada, the 12th most prominent mountain in contiguous America, and the 11th most topographically isolated summit in contiguous America. Although its simply a long day hike in the summer, the winter offers a new challenge for this mountain. The technicality of the climb is easy however it is in one of the ultimate wildernesses of the continent. The Great Basin is a land of weather and temperature extremes so make sure that you are well prepared for its challenges.